Perpetrators of trouble are easily identified. In other Jobs essays, we discussed the problems and we also discussed innovative solutions from cutting red tape to solutions for offshoring and illegal immigration and others. This essay is the bottom line on how to get the inertia rolling the other way. This is the road to recovery from this unprecedented recession. There are only two groups in America it seems who do not know the basic way to get the United States out of a recession. The two groups are the Legislative Branch (Congress) and the Executive Branch (the President and the Czars and the Bureaucrats). I bet even the Supreme Court knows how but they have to be asked to render an opinion. We have been in recessions before as we discussed in other Jobs essays and they were almost all solved by doing two simple things. The government must stop spending and cut taxes. Then, and only then will the people be able to have money to spend more on real stuff. Though the budget is a trillion and a half out of whack, it must be balanced or be on its way to being balanced to escape a further deepening recession. The elite in my party think we can spend our way out of debt. If that ever worked and it looks like it never really worked, it is not working now. One of the dumbest things the two know-nothings (Legislative and Executive branches) are considering recently is something called a value-added-tax or VAT. We must fight this with all our muscle as the fiscal end is near if a VAT is passed. It is an unseen tax and dishonest Congresses love bringing pork home unnoticed. Only if the 14th amendment is repealed should we consider a VAT, and then it would be known simply as the fair tax. If thee is still an income tax then this is government's licenese to steal by spending, and there can be no economy to provide the government with its revenues once we are all broke. The VAT will not reduce the deficit anyway. In fact, it would cause the debt to continue to rise because the President and the Congress have insatiable spending appetites . They will take any money we give them to make the economy better and they will just throw it away on expanding the welfare state. This will be another tool with which the government can redistribute wealth and spend much more on stupid and frivolous projects. Maybe if they spent some money on NASA, along the way it would not be so bad but NASA is not part of the all-encompassing welfare plan. President Obama has decided we no longer need NASA, one of America's greatest intellectual treasures. Rasmussen (the polling organization) has found the public to be well aware of how to solve the problem. Voters agree that tax cuts would help the economy lots more than increased government spending. We have seen the spending side and it does not work. The economy remains un-stimulated despite the stimulus bills and job losses continue at record paces. Why do they not say enough already. Instead the Congress voted in Obamacare, which at a minimum will raise expenditures by $1 trillion and many are suggesting that it will be more like $3 trillion. Though interest rates are being kept artificially low, inflation is already taking hold. Please do not use the consumer price index as a guide to knowing the inflation rate as it is a formal instrument for government lying. Bureaucrats use it to dupe the public to suit their purposes. One place it is used all the time is to set for social security take home amounts. They lie like rugs. Go buy a rug and see if it is less expensive when the CPI is low. Better yet, go try to buy a grocery cart full of food. How is everything more expensive and yet the government tells Seniors there is no inflation. Again, get its straight, they lie to suit their purposes. Taxation through currency devaluation is very easy to do. Moreover it is the politically expedient course; but it is also more damaging as your dollars become the size of the one in Gordon Liddy's Rosland Capital commercial. Government cannot continue secretly taxing through borrowing (a.k.a. deficit spending) yet they are. Is the Fed secretly printing money? Inflation is socially and economically destructive in that it wipes out fortunes for those who are not invested in hard assets. if you want to know the pace at which the dollar is devaluing, look at the price of gold. The stock market is rising strangely enough but that too is because there is nothing worse to own right now than cash. Inflation is taxation but it is silent. With a corrupt media, it is even more silent. Though taxation is not the answer, if citizens were forced to pay through direct taxation up front, the voters would be shocked. They would immediately see that there really is no free lunch as promised. Though more and more people understand that nothing is free, still others think government creates money, and they are convinced Obama has a "stash.". They secretly believe that in Fort Knox and its surrounds, the US plants the whole world's supply of money trees. The dollar is the world's currency right now because these trees grow various denominations of dollars. The trees cannot grow Euros, for example. Congress would not be able to go out in public if some of the public really knew that the trees do not exist. Politicians spend the people's money. Those who think the government creates money just cannot see the problem. Before we continue let's review the notion of a tax. A tax simply is money collected by government directly or indirectly from the people to cover the huge expenditures of government. How does the government get the people's money. Though tax systems are supposed to be voluntary, the Government gets its money by force. We know that intrinsically. The IRS may very well be toting heat in the future when the citizens stop coughing up the cash willingly. What force is typically applied? Government decrees that you and I and businesses will pay a percentage of our income to the Tax man (the IRS). If you or I or any business refuses, we are faced with fines, imprisonment or both. Since a business per se cannot go to jail, its officers may be held liable and they would be sent to the Big House by the IRS as necessary for it to collect what it is owed. If somebody else took your money by threat or force, it would be stealing. Government confiscates funds and does with them as it wishes. Your dollars often wind up in the pockets of your neighbors. And, yes, it is stealing. This idea called government borrowing is a misnomer. Why the Chinese think they are going to get paid back is a mystery unto itself. There is no chance at all that the government will ever repay any of its debt. Who are we kidding? You may know that there was hardly any debt at the turn of the 20th century. It went from $2 billion to over $10 trillion in this past century, and there are at least $60 trillion in SS pension and Medicare promises via worthless IOUs that will never be paid back. The US Congress as custodians of the treasury have served no better than a pack of charlatans. They assure their reelections by robbing the treasury to provide pork to their people. When the people take the pork, the people get the government they deserve. Consider a valuable object that must remain safe for national security reasons. Suppose Congress, on one of its few holidays, chooses to guard the valuable object. My high opinion of Congress goes this far. Unless the object, which the Congress is guarding is discovered to be a combination of roach, aunt, mice, and rat feces, the chances are that when the trusted guardian returns and asks Congress for the guarded treasure, the lock box will be empty. That is how well the Congress, the custodians of the people's treasury have guarded the peoples various lock boxes over the years. The only problem with the lock box idea is that they gave Congress the keys. So, Social Security, medicare, and any other treasure that needs to be guarded, needs to be held on a planet other than the one in which Congress resides. They are thieves for sure. Do the people get hurt when government borrows? The word again is price inflation. When government borrows, and when the Fed is operating normally instead of under Obama-constraint, interest rates rise and the Fed lowers those rates by monetizing the Federal IOUs. When there is more money in circulation, your money loses its purchasing power. So, yes, the people do get hurt even when the government borrows instead of raising taxes. If the dollar were forced to be reduced in size to match its value, Gordon Liddy would in fact have the first printed bill at the correct size for 2010. Whenever the Liddy Ad comes on TV, I stop and call my wife's attention to it. It is the face of the future. If the government had to continually reduce the size of the dollar to match inflation, eventually people would need tweezers to hold on to the dollar bills used to purchase their wares. The smaller the bill, the less it would buy. As people traded in their huge dollars for smaller and smaller sized currency, Congress's game would be up. If they taxed us, we would know it and if they had to resize the currency such as the Liddy Dollar Sizing System, to match its devaluation, we would also know it. 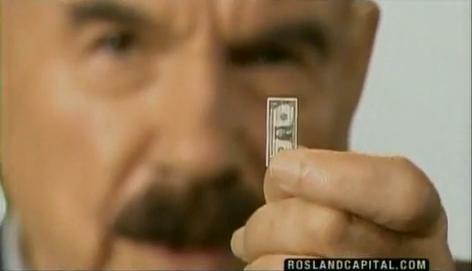 And in all cases, G. Gordon Liddy would forever get the first reduced sized dollar. Just as the one we show above. Inflation without dollar resizing makes it very difficult and probably more like impossible for both consumers and businesses to plan ahead. When businesses cannot plan ahead they like to have as few employees around to pay if they are not sure that they will need their labor. So, Jobs! Jobs! Jobs! does not occur in times of economic uncertainty. Since this is a time of uncertainty, one would rightfully ask, why is the government intentionally devaluing our currency. Only the President and Congress can answer that one. It make no sense. When businesses cannot plan, their growth is impeded and when business growth is impeded you can forget about having progress in every aspect of society. Society is dependent on many things. For example, at its simplest, society is dependent on things being good. If the people were taxed outright and honestly, we would revolt. Well, at least you would, hah! However, the slow sting of inflation is just what the doctor ordered for a Congress more interested in snookering constituents than representing them. What is unseen is never blamed. There are no champions in this Congress, therefore none of us should lament when all of them are dismissed by the people. You know that technology is such today that it would be easy for the government to set up an electronic wallet for everybody so nobody would be forced to carry dirty, slimy, cash. Though I do not know the man, something tells me that Bill Ayers would not want the government knowing how much walking around money he was carrying. And, let's face it, the government is the least secure entity on the planet so if somebody wanted to know your wallet contents at a given moment, they too could hack the government system. Why bother taking on the cash-rich before you know they have gotten to their ATMs? How innovative and how beneficent that would be of the government to take on the responsibility for managing all of the wallets in the country. It is such a powerfully fulfilling thought that it almost wants you to stand up and declare that banks are no longer needed. The imperial government can handle the cash and one would suspect can give a better rate. Unless, of course, like Bill Ayers, on some matters, you are a realist. The government would own you even if they did not charge a dime for the service. When the "Big Government" chose to levy a new fee or a "simple" adjustment of a prior adjustment of an adjustment, once the paper trail looked more like oblivion than the Olive Garden, they could just take the funds immediately from your electronic wallet. Under this system, Government would not need to process those long and nasty lies (tax returns) sent in every year by taxpayers. Rooting For the Government to Win the End Game? Real radicals would ask, "Why should the government have to wait until April 15th to get their money." Hey, for historical purposes, if the tax code ever changed for the good, that could be the day of reckoning or the day of accountability or the close day or whatever you would like to call it. I predict April 15 will always have historical significance. It would be more difficult for the government to fleece you if paper cash were used. But some might say it would be a grand day if the government were able to remotely lift your wallet from your pants--even as you were watching. Then, it could riffle through the bills and the change, perhaps even read the credit card stripes and even check all your accounts. You would never have to fear being audited again. Auditing would become a daily notion. The hard left might propose an even slicker idea. Why should you have to go to the Post Office on April 15 to fulfill a duty. The government could electronically spare you the trouble. In a perfect world, the physical dollars could be activated to flow from your wallet to the closest mailbox and they could be electronically identified as coming from you -- perhaps via a dollar / retina-like scan. Then the postman, in addition to doing regular mail, could pick up the cash from the mail box and turn it into the US treasury. It may not really be able to be done now (2011) with real dollar bills but if Obama has his way, this can all be done electronically. You would then have to spend only what the government has not taken. Can you imagine how easy it will be to contribute your "fair share." Nobody would be left out of the reach of the automatic electronic hand of the IRS. By the way, as many know, tax preparers this year must electronically submit your returns to the government. Hmmmm! Nah! The government can be trusted, right? Why did nobody think of this before Obamatimes? Why should government be the last served? In the new system, when government needs anything, the electronic dollars, though in worth they may be the size of the Liddy Dollar bill, would be electronically lifted from your electronic wallet. You vill be happy. These dollars will then head down an electronic speedway to the electronic national treasury where you can visit them once a month but -- no touching. The bottom line is that if every dollar spent by government came immediately out of taxpayers’ wallets (your wallet), Congress might just find it impossible to fund their vast pork-barrel spending programs. You would not stand for it. You would see the fruits of your labor disappear before you. No, don't even think of the other side of the coin. If they can see every dollar coming from your wallet, should they not show you every dollar they spend? How about just your dollars? But, they will tell you that is too much work, and because you may not have decided yet that government cannot be trusted with anything valuable, you might agree. FYI, in the future try not to confuse when government chooses not to do things that are reasonable, it is not working for you. Time for the replacement players. Life would become better as we would definitely throw the bums (Congress) out when the first pilferage occurred. Then, we’d all be able to plan for our future, knowing that our savings would be there and the bills would be able to be paid. Unless, of course, they had already captured the country. Congress gets away with this crap only because we the people accept it. Only conservatives line up against this and liberals, though not stupid by any means, hear our arguments but do not buy them. The far left cannot accept that these exploding deficits mean that they are laying the burden of this huge debt pile on their children and grandchildren. Maybe they are right! Do you think that the real hard left liberal progressives think the next generation (grandchildren) will solve this financial dilemma? Let me ask a different way. If they felt that their grandchildren were going to be asked to pay up for grandpa's excesses, would they not stop the excesses? Unless they think their offspring will be so smart they can figure a way out of it, or they think that money grows on trees, they can't want to dump this on the grandkids. Yet, they do! 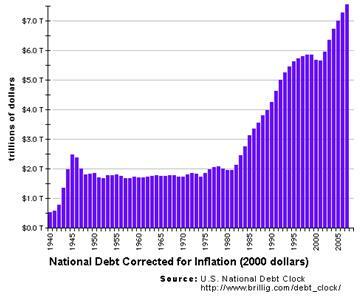 Since they really do not want to dump all this debt (our debt) on the next generation my logic tells me that they probably are really concerned about their kids and grandkids, and so, they should be in the Tea Party. Yes, even liberals should be in the Tea Party. The government is all consoling and all-eradicating. Don't look for anything to be left when the administration finally gives up on socialism. All of us have been duped into thinking it will take a long time --- why else would there be references to children and grandkids.? . Hah! All US citizens will be paying what can only be called a fraud tax in the months ahead as price inflation soars. It is not waiting for the grandkids to be born It is right around the corner. When it breaks loose, who are you going to blame? Actually, if you filled up your tank or went for groceries lately, you already know it has already broken loose. How long can bad last before it gets worse? Most people will not blame the government. When bin Laden was captured, tons more Americans were willing to forgive the economic perpetrator in charge for their wallet woes because of this one great act in 2.5 years, More unbelievable than that, people began lining up to elect him President for life. Thank God that over time, all people come to their senses. If I were the Prez, and I was interested more than anything to get reelected, even moreso than in my fellow man, that would mean that getting reelected really mattered and it trumped all. I would come up with another bin Laden plan. It's working now so if it could be staged for 2012, Obama could be brought in by acclamation. Perhaps no vote would be required. Think of a plan such as this. After freezing Ayman al Zawahiri 's's's's body that was captured along with bin laden's, it could be held until the right time before election night, 2012. The Obama campaign might show how he was captured and the greatest leader of all time, Barack Hussein Obama can be shown pulling the pin on the grenade. Does government lie? Indeed! Like it or not, the big culprit today is the government. If the people rose up in unison as occurs in less civilized countries, and blamed the government, we could actually solve the problem. The government is the problem. Yes, we have met the enemy and it is the government of the US. The government is the culprit, and the good news is that we have the ability and the authority to change the government without bloodshed every two years. The tool we use has a simple name. it is called a "vote." This cannot be fixed with monetary policy as it will lead to hyperinflation. The losers will be those with cash or treasury bonds. In other words, all retirees would be suffering big-time. The holders of such bonds would never receive fair value market value for their investment. The dollars they would receive would be liddy-sized and if China were shipped a pile of Liddy dollars in a small bag for their trillions in holdings, they might create a different kind of economic crisis. Among the suggestions is to replace the income tax with the FAIR Tax. I like that an awful lot. Get rid of the Income Tax completely as we have been suggesting in many essays. Replace it with the FAIR tax. Instead of businesses protecting their earnings by eliminating jobs, they could pay as they go and be able to plan. A consumption tax such as the FAIR tax removes the disincentive for business to invest and it creates Jobs! Jobs! Jobs! Additionally, it has the effect of making products and services more expensive, and this encourages saving. Some might call this a "virtuous cycle" as it adds to the pool of invest-able business credit; it lowers real interest rates; and it creates further business investment and jobs. Glenn Beck and others have been analyzing our spending patterns, especially as it relates to Defense. Many, many conservatives worry that the President is too naive about the dangers in the world. Many think that he believes that the US should unilaterally disarm. They view him, the President, in his usual and customary role of the Pied Piper enabling all other nations who are apt to follow the Piper, to disarm. If we can get past that without totally ignoring Obama's propensity to do good even if it is bad for America, Glen Beck and others have shown that major savings could be garnered by getting it all done quickly in Iraq and Afghanistan, countless billions and billions could be saved. There are also solutions for Medicare and social security that will not bankrupt anybody and not stiff any current beneficiaries. The more important future scenario is that America still exists and America is still a capitalist country! So, then what is the simple secret? Herbert Hoover's Treasury Secretary Andrew Mellon cut taxes in the mid 1920's and the economy healed. For Roosevelt, all of the wonderfully progressive notions he enacted helped a lot of people but did nothing to bring the economy back to the good days after the Mellon tax cuts. After World War II, the economy finally began to revive but Dewey was president by then. In the 1960's John Kennedy cut taxes and the economy healed. Ronald Reagan in the 1980's cut taxes and the economy healed and boomed. George Bush, after 911 (September 11, 2001) was faced with a stagnant economy and he cut taxes three times over the years, and the economy came back but died down near the end of his last term. The Bush solution should have been more tax cuts and less spending but he did not do it, and President Obama continues reliving the big Bush mistake. . The 2008 collapse should have been predicted by banking regulators. A number of poorly conceived economic policies were forced upon the financial sector and they have been softening the strengths in the financial industry for a twenty year period before the 2008 collapse. Force, remember that word from earlier in this essay, was the perpetrator. The strong arm of the government caused the problem. The government forced the banks to do things that could not work in the long haul. The banks never would have gone this far if left to their selfish profit motives. The bureaucratic regulators, charged by a dysfunctional and too altruistic Congress forced the banks to break sanity rules. The message from Congress to the banks was, "Loan to anybody who wants a home, or else!" When the banks began to fail, Congress blamed the banks even though it was the same Congress who forced them to endure the losses they experienced from making so many bad loans. So, why are the banks not laoning in mid 2011. They cannot trust the government. A few soldiers, strac, and brave did appear from the Congress. These "brave" men, a full trio of "Mighty Mice," included Barney Frank, Christopher Dodd, and our own Pennsylvania native Paul Kanjorski. They decided to help the banks while the proletariat (We the People) were screaming, "No Bailouts!" These three believed they knew better than the people and they acted accordingly. Their work helped cause the crisis and now their work, approved by the House and the Senate, including Pennsylvania's own Bob Casey Jr. Has been lengthening this recession. Their CRA and poor banking regulations along with poor oversight caused the problem. Spending money on a failed GM, failed banks, Freddie Mac and Fannie Mae, exacerbated the problem. It helped keep the economy at a standstill long after it hit bottom. The people wanted no part of it. If all these deals were so good, you and I know that the three dudes in charge would have figured out some way to put some of their own sheckles into the pot to assure getting a lot of sheckles in financial returns. They made nary a buck! The verdict on a lot of this is already in. We know the bailouts and the stimulus packages all were ill conceived and doomed to failure. Only a fool would have invested in a deal that would cost more than it was worth. Barney, Chris, and Paul stuck the American people with the bill for their ill-advised largesse. No matter what we do, GM will have cost the taxpayers $billions that will never be returned. GM is going out of business some day soon without more government help. No sane person would have gone for the Frank / Dodd / Kanjo deal. These three stooges stuck John Q. Public with the tab for their unsupportable and unprecedented schemes. For everybody but the people, the bailout decisions were good. The people have remebered the 111th Congress in the Primary and again in November. If it were not for some real goofy Republicans, who are not real conservatives, such as Carl Rove, the guy who ruined Bush's presidency, conservatives probably would now be running the Senate. Now, as if nobody remembers the truth, ironically all three Congressmen have lined up to take credit during their campaigns for their sheer brilliance in avoiding a catastrophe. The Californian and the Nevadan were brought back but the people of Pennsylvania said no to the 13-term self-serving Congressmand from NEPA and life in the House of Representatives is a lot better in the 112th Congress. "The Federal Home Loan Mortgage Corporation (FHLMC), known as Freddie Mac (NYSE: FRE), is a government sponsored enterprise (GSE) of the United States federal government... The FHLMC was created in 1970 to expand the secondary market for mortgages in the US." "The Federal National Mortgage Association (FNMA), known as Fannie Mae, was set up to be a stockholder-owned corporation chartered by Congress in 1968 as a government-sponsored enterprise (GSE).,. [it] was set up as a stockholder-owned corporation chartered by Congress in 1968 as a government-sponsored enterprise (GSE), but founded in 1938 during the Great Depression. Fannie and Freddie have a big role in what some might call the welfare state but it goes even further. What do these financial cousins, Fannie and Freddie actually do? Their mission was and is to buy mortgages from savings and loans, banks and other lenders. The bank makes its profit on writing the mortgage up front and Freddie and Fannie assume the mortgage. This gives more cash for banks and other lenders so they can make many more home loans. Unfortunately for Americans, Fannie and Freddie together, right now either hold or guarantee $5.5 trillion of mortgages. This is about half of the US's outstanding home loans. Think of how big this trough can become. Thank you Barney, Chris, and Paul. So what got these institutions in trouble? Well, as home prices fell, foreclosures went up, and lenders ran into trouble, as did Fannie and Freddie. Loans they backed went bad, capital became harder to come by and it was harder for Fannie Mae and Freddie Mac to find buyers for their their loan packages. So, what did they do? The politically correct answer is that they compromised and compromised and this led to lower and lower standards and so they were "forced" to back even riskier mortgages. As we learned in 2008, all this came back to bite them. Barney, Chris, and Paul were there from the beginning, and should take credit for helping to cause the collapse. The politically incorrect answer is that Congress repealed depression era legislation designed to prevent catastrophes such as this. Additionally, Congress passed multiple versions of the Community Reinvestment Act (CRA) -- the last update was in the Clinton years. This was so that even people without a dime could qualify to get a mortgage for a home. The main criteria was reduced to whether the potential mortgagee was breathing or not. The CRA more or less forced banks to loan at 105% or 110% of home value to people who could not even afford a rented apartment. The joke in states like Florida was that not only did they get a house they could not afford but there was a Lexus in the garage when they moved in -- all financed by their mortgage. While property values were rising, this was not a bad deal as everybody was a winner. As home prices fell, it all blew up in everybody's faces. Barney, Chris, and Paul were supposed to have been watching. Barney, Chris, and Paul had the banks as well as Freddie and Fannie over a barrel so they squeezed them to take on bad loans. The system had to break. The caretakers were the perpetratorss who actually broke it. These are the kind of loans in which the mortgagee brings nothing to the closing and if need be his lawyer, at the closing, types up a fake W-2 and other needed documentation to assure the loan. Everybody at the closing and the approving bank officers all knew this was a sham while they were taking in huge dividends for each bad mortgage they knowingly wrote. There was always hope on the horizin provided by Uncle Sam. Merely by getting the documentation correct, at least the bank would have a record of why they approved the loan to the applicant. It was forced institutional fraud. Everybody knew it was a joke, but they had to commit fraud in order to be in compliance with the banking laws. In the last twenty years or so, being a liar was essential to being trustworthy in the financial industry. Can you figure that one out? There is no secret anymore. The government knows what happened. They are just not talking Yet, Barney, Chris and Paul went forward to pass legislation that makes permanent the notion of too big to fail, subtitled, the government will bail you out if you fail. Which of our esteemed lawmakers argued against this? Nobody signed up to gain that classification. Maybe they are all crooked. In the last third of April 2010 as I was finishing a book called Jobs Jobs Jobs, the Republicans were trying to figure out how to tell the American people that the big three -- Barney, Chris, and Paul, but mostly Chris, were really not trying to regulate the industry. Chris had just taken an illegitimate mortgage so he wasn't doing much talking. Paul was invincible as he had never been defeated in 13 terms. They were all trying to set up the country to have to pay for the next bailout. With President Obama out on another campaign tour to sell " banking regulations" to the people, the Republican dilemma was that the people want good banking regulations. What they got was more of the same. Unfortunately, many people still trust Obama, Pelosi, and Reid, and even Paul Kanjorski, who ic no longer a US Congressman, for that matter. They still can't or won't believe that Congress can intentionally perpetrate a fraud on the American people. The fact is that Republicans and Democrats had a deal going to make sure the legislation stopped Wall Street in its tracks, when the Democrats, my political party, with Chris Dodd, a big part of the original financial crisis in charge of negotiations, pulled out and softened the legislation so some good friends could gain, and perhaps he could be assured of never being prosecuted for malfeasance in office. But, who is counting? Among other things, this trio created a $50 billion slush fund to bail-out any banks that failed. When that $50 billion was gone, the legislation authorized Congress to grab another $50 billion for the next "too big to fail," to not fail. The people want them to fail if they squander the people's assets. The people want to get bad banks out of the system. The legislation from the corrupt trio did not do that. Yet, some say It must for the stability of the future. But it does not! Despite the facts, with Obama on continual whirlwind campaign tours, and the AMerican people forgetting who he really is, we are left with only the Republicans telling the truth. It was almost impossible for the GOP to convince the loyalists in the Democratic party that Congress had set the people up again for a round of perpetual bailouts. Yet, it is true. To make matters worse, one of the sticking points that caused Dodd to get up from the negotiating table with Republicans and strike out on his own was the treatment of Fannie and Freddie. Dodd completely let them out of his bill. Fannie and Freddie and government control of the mortgage industry had a lot to do with all of the financial failings. The Republicans were right. Leaving them out of the legislation to wreak more havoc is dumbheaded. But, then again Chris Dodd was on shaky ground. Do you think banks who do not make it should fail? What if their failure is because they trusted that the government would protect them when they acted irresponsibly? I say yes they should fail. Should Fannie and Freddie Fail? I say yes again. Maybe housing will get so affordable that regular people can afford to buy homes again. We need to get all this bad debt off the books and let the people who gained, pay the price -- not the taxpayers. Besides dealing with "too big to fail" in a responsible way, the secret to solving the recession is to simply cut spending and lower taxes. I would recommend corporate reforms for offshoring and we also need to correct the problem of illegal immigrants holding American jobs. Both of these are well covered and explained in other Jobs essays. If we do all that, we can get this ship floating again without using Gordon Liddy dollars. "Changes in marginal income tax rates cause individuals and businesses to change their behavior. As tax rates rise, taxpayers reduce taxable income by working less, retiring earlier, scaling back plans to start or expand businesses, moving activities to the underground economy, restructuring companies, and spending more time and money on accountants to minimize taxes. Tax rate cuts reduce such distortions and cause the tax base to expand as tax avoidance falls and the economy grows. A review of tax data for high-income earners in the 1920s shows that as top tax rates were cut, tax revenues and the share of taxes paid by high-income taxpayers soared." Don't expect fundamental change until this fundamental law is followed (enforced) by the current Administration or we are able to change the Congress and the Presidency before it is too late. To repeat, the bottom line on ending the recession is to cut spending and reduce taxes. Neither of these will occur, I am afraid, if it is left to this administration. While browsing the Web, I found a lot of great citizens commenting on the financial dilemma and offering their view of a good solution. All these quotes are from Sodahead.com, even if they are paraphrased. Some are so precious, the fast readers of this article (scanners) may very well skip what I wrote and go right to this good stuff. I will place any additions I made in brackets to differentiate it from all of this quoted material from "sodahead." 1. "And on top of that, they can get rid of all the illegal's we are supporting, cut their (the Government) wages to something more manageable by us, stop sending money to 'help' other countries when they don't do anything with the money to help themselves. 2. "Most of all I want their dang hands out of MY pockets so I have more money to spend at the store and stimulate the dang economy! 3. "Please do not discount the value of Time...we should not have to spend our Time sorting out the complexities of government tax policy. If we want to go forward, the path should be simple...we pay a fixed percentage for government services, and leave it to the elected officials to spend their "cut" to best effect. 4. "Nor will I hold my breath. The entrenched will not subscribe to change which does not benefit them. 6. "Exactly!! Sending the money we've borrowed from China to countries that steal it from the people that actually need it. Gosh.... this country is starting to sound a lot like that. "It's elementary. If you have money, you either spend it or save it. If you save it, then someone else has a chance of borrowing it thereby stimulating the economy. If you spend it then you will stimulate the economy. If you don't have money to spend or save, then you voted for Obama." 8. "I agree - The government should only be allowed to spend what it takes in taxes; and maybe the public would realize that there really is no such thing as a free lunch when they see what the real cost of all the entitlements are. 9. "It's a little like closing the barn door after the horse was stolen, but we really need a constitutional amendment to balance the budget annually. 10. "If we survive this, they will just do it again unless they are legally precluded from doing so. 12. "I agree - The federal government needs to stop all the reckless spending which would allow them to lower taxes and stop borrowing at the same time.